GET BREATHTAKING LAWN THANKS TO THE ROBOT LAWNMOWER HUSQVARNA! What would you say if we told you that you could relax and enjoy the good times with family and friends while a robot mows your lawn? 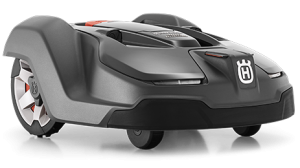 Now it’s possible thanks to Husqvarna’s Automower robotic mowers available at Robogazon! The robotic mower is an invention that has proven its worth in Europe over the past two decades and that has finally arrived in Quebec. Silent and autonomous, it takes care of your lawn so you don’t have to worry about it and produces perfect results every time. The robot is electric and recharges itself automatically. This makes it a very eco-friendly choice, since no gas is required and no polluting emissions are released into the air. How does the robotic mower work? You choose when the robot is activated. This function allows you to operate the robotic mower at night if you prefer, leaving the path clear for you to enjoy your lawn during the day. Imagine all the time you will save! Thanks to its advanced technology, the robotic mower guarantees you a perfect lawn with minimal intervention. It improves the health of your lawn by only trimming the grass a little each time but doing so frequently. This allows the grass to create its own natural fertilizer and limit the appearance of weeds. The robotic mower works through a mobile app that you can download to your iOS or Android smartphone to control your machine remotely. From the app, you can start or stop the robot, modify its parameters, or monitor its position using GPS tracking. 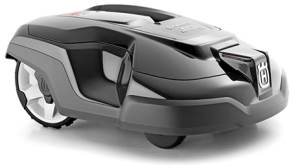 Because it is water-resistant, the robotic mower can be used every day, without being affected by the weather. Its intelligent system also allows it to avoid obstacles like flower beds and trees. It can even climb steep slopes, but don’t worry: it will never leave your yard thanks to a cable buried underground that acts as an invisible fence. 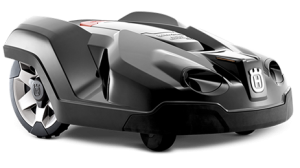 Discover the AUTOMOWER robotic mowers from HUSQVARNA available at ROBOGAZON. Ask for a quote today!